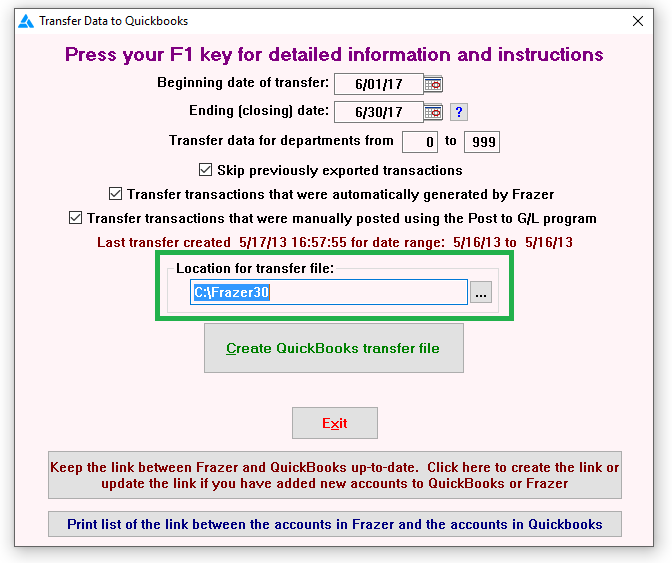 After completion of Part II of the Quickbooks Interface setup, proceed to the following steps to transfer data from Frazer to QuickBooks. Go to Accounting >> 5 - Transfer Data to QuickBooks. Enter the date range of the accounting transactions for transfer. The box to Skip previously exported transactions is checked by default. Frazer automatically generates General Ledger transactions associated to any activity in the program. The box to Transfer transactions automatically generated by Frazer is checked by default. Uncheck the box if the automatically generated items are NOT to be transferred. The box to Transfer transactions that were manually posted using the Post to G/L program is checked by default. Uncheck the box if the manually posted items are NOT to be transferred. Click on . A FrazerImport_[month]_[day]_[year]_[time].IIF file will be created (i.e. FrazerImport_3_27_2013_1643.IIF). Go to QuickBooks, and open the Company File. Go to File >> Utilities >> Import >> Lists to IIF files. Browse to the FrazerImport_[month]_[day]_[year]_[time].IIF file located in the Frazer30 folder (or source folder* for Frazer) and select the file. The transfer from Frazer to QuickBooks is then complete. In >> 1 - System Options >> 8 - Accounting a General Ledger closing date will be automatically populated after the transfer.